Archery can be defined as the art of shooting arrows by using a bow which is thought to had been mastered already during the stone age. Humans are estimated to use bows and arrows for hunting and probably also for combat as early as 20,000 BC, while the earliest indication of archery in Europe dates to about 9,000 BC. There is, however, no doubt that humans mastered bows and arrows by the period of the earliest civilizations in the 5th millennium BC. Archers had an important role in the ancient warfare despite the fact that they did not always play the central role in the battles. However, all ancient civilizations including those of the classical antiquity celebrated outstanding archers who enjoyed a heroic status. Archers continued to play an important role in warfare during the Middle Ages as well. They often played a decisive role in the outcome of battles, while the most famous battles that revealed the power bows and arrows took place during the Hundred Years’ War – the battles of Crecy (1346), Poitiers (1356) and most notably, the Battle of Agincourt (1415) in which the English longbow archers heavily defeated the French army that mainly consisted of fully-armoured knights. The importance of archery for warfare began to decline after the introduction of gunpowder and firearms in Europe and by the end of the 17th century, archers disappeared completely from the European battlefields. But the art of shooting arrows by using a bow survived and the first English archery societies were established as early as the 16th century. Over time, archery evolved into a popular sport which was practised by both the nobility and general public. 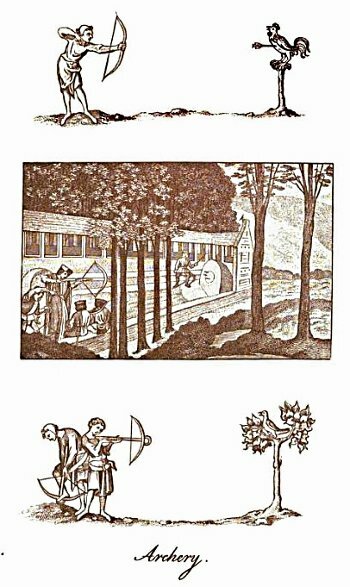 The 18th century saw establishment of new archery societies throughout England, while England’s example was followed by other countries after archery became an Olympic discipline at the 1900 Paris Summer Olympic Games. Great Britain, however, did not participate with its archery team in Paris nor subsequent Summer Olympics in Saint Louis. British archers competed for Olympic medals for the first time at the 1908 London Summer Olympics and won 5 medals. After 1920, archery was excluded from the Olympics and was readmitted to the Olympic schedule only in 1972 thanks to the efforts of the World Archery Federation (French: Fédération Internationale de Tir à l’Arc, therefore abbreviation FITA), the governing body of modern competitive archery. FITA was established in 1931 in Poland by seven founding states which besides Poland also included Italy, Hungary, Sweden, France, the United States and Czechoslovakia. In addition to returning archery into the Summer Olympics schedule, FITA also organized Target World Championship which is held since 1931 (from 1959 every two years) and the first World Field Championship which was held for the first time in 1959. Today, FITA has 146 member associations including the GNAS (Grand National Archery Society) which is the governing body for archery in the United Kingdom. It oversees the work of more than 1100 clubs and has about 30,000 members.